Bangalore: Pro-Kannada organisations along with Swami Yogeshwar Rishi Kumar of Kali Mutt took out a rally from the Koti Anjaneya Temple to Nithyananda Swami Dhyanapeetam Ashram in Bidadi on Sunday, condemning the roughing up of media personnel by followers of self-styled godman Swami Nithyananda. Over 3,000 protesters took out a padayatra holding placards and banners condemning the actions of “Nithya Bhaktas”. The rally halted at some distance from the ashram as the Ramanagaram police had provided bandobast and had clamped down prohibitory orders there, where they sat on a dharna. Later, the protesters handed over letters containing their demands to tahsildar Ravikalnahalli. The agitators also demanded that posters of the controversial godman be removed in the highway stretch along Bidadi, which the tahsildar ordered. Speaking at the protest, Swami Yogeshwar Rishi Kumar said, “I have demanded officials to ostracise Swami Nithyananda and seal his ashram. Also, the arrested Kannada activists must be released and the ashram inmates must be jailed.” He added that he and seer of Kolaka Mutt will go on an indefinite hunger protest on June 14 if their demands are not met. Outfits such as the Karnataka Suvarna Sene, Spandana Women Rights Organisation and Karnataka Nava Nirmana Sene will participate in the protest. 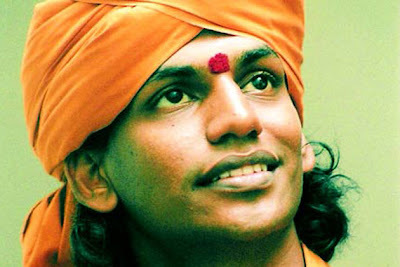 Earlier, Nithyananda allegedly disappeared from the ashram when inmates of his ashram roughed up media personnel. A scribe had filed a complaint against the godman and his disciples. Police detained a total of 35 persons and imposed section 144 of the IPC. While a few persons were let off, others are still in jail. Reacting to the reports, his official blog said that he was in Madurai and that he will return to offer pooja, in addition to holding a press conference.